Half-hardy, compact bushy perennial, often grown as an annual. Terminal spikes of blue flowers which are surrounded by fuzzy white sepals, carried on white felted stems. 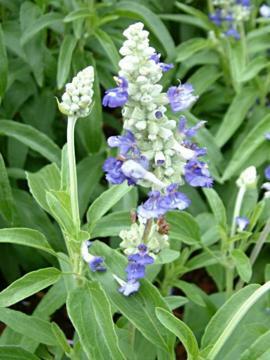 Lance-shaped, wavy-edged, greyish green leaves, white-hairy underneath. Most well drained soils in full sun. Needs frost-free winter conditions or treat as an annual. Bred by Floranova, Dereham, Norfolk, UK.